complex that stood for nearly 200 years, spanning French, Spanish and American rule. the council chambers. During this period, the jail was referred to as the "calaboose." The term was still used by locals many generations after the Americans came to power. still haunts the old prison courtyard to this day. constructed, there was still a jail in the complex, part of the police station on the site. 1914. 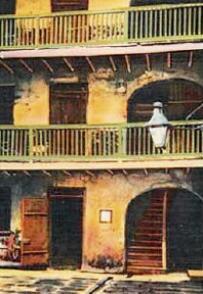 These structures still exist today in the Cabildo's courtyard.